Currently, mobile commerce is a portion of web commerce, but experts believe in a few years’ time it will become the traditional web commerce. Businesses of all sizes are preparing for the explosion of mobile sales, which brings with it a multitude of developmental questions. Determining what devices to target, how to create applications that are user friendly and effective and how to ensure the security of the data that is uploaded, as well as downloaded, is a large part of what developers must consider. The importance of developing these apps lies in the ability to further marketing capabilities, increase customer service and drive sales. There are numerous developmental environments developers have to choose from. Native Development Tools: These tools can be used on specific platforms. While this is useful in creating many unique functions in each app, it does limit the number of users businesses can reach. Developers will have to create an app for each platform they want to target using these tools. Cross-Platform Tools: If there are many platforms businesses want to target, the cross-platform tools are recommended. It is important to understand the functions of the app might be limited as opposed to the native applications. Careful consideration needs to be given to the cross-platform development of applications, especially in terms of design. Developers need to have rigid guidelines in place for their team to ensure it works well and is appealing on every platform. User-Friendliness: Usability is a key component in the development of an app. Your app could be the first impression many consumers have in regard to your business. If it is not easy to use or confusing, they could easily turn to your competitors. Power Consumption: If the app that is developed for your business drains battery life, it will quickly turn consumers away. Online Storage: Allowing storage while online enables real-time synchronization of important business data. Offline Storage: Allowing offline storage capabilities enables all users to store data, even while not linked to a Wi-Fi or cellular broadband network but allows syncing once the connection is made. Analytic Capabilities: It is always important to understand how your customers are linking to you, what they are doing and if they are enjoying the experience. This is all possible through the proper analytics program. In addition, it allows you to instantly be made aware of technological issues that need to be dealt with. When developers keep all these factors in mind, they will be able to create a platform that is functional for all users. In addition, they should incorporate consistent testing and analysis to determine if the application is performing exactly how businesses wished for it to function. 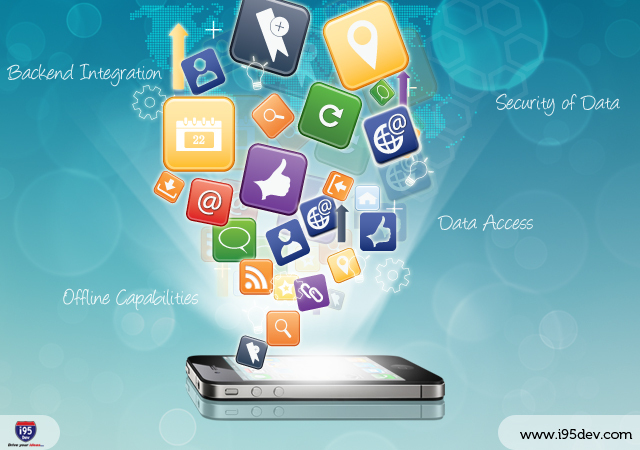 The experts at i95Dev can help you create the perfect app for your business. Our extensive expertise enables us to guide you through the entire process, determining which method is right for your needs. We have the expertise in the business to help your app succeed the first time around.